Part of my research for our project was to identify and locate as many of the 1200 some objects included in the 1913 exhibition as possible. This sounds doable in light of the excellent resources now available to art historians, and in the cases of major works by the best known artists in the exhibition, it was very easy. But for the more obscure artists, and even for minor works by major artists, finding these things posed a significant challenge. 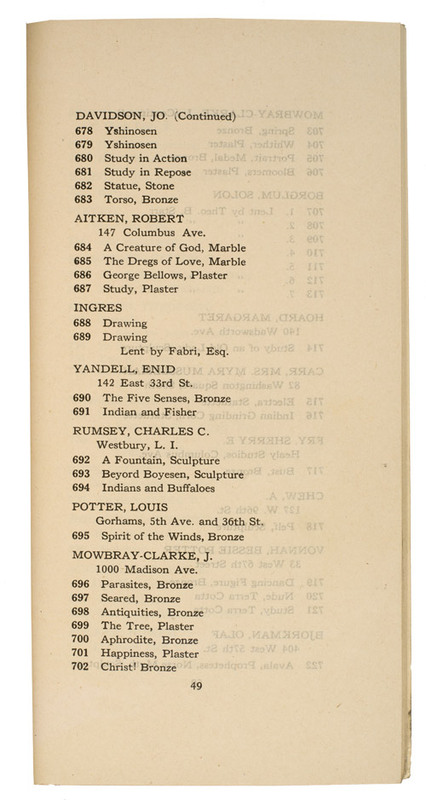 The Armory Show’s organizers published an exhibition catalogue with artist names, titles of works, and media; and previous scholars have compiled information on dates, sale prices, lenders, and purchasers. But when the title in the catalogue is something like Drawing or Landscape, this isn’t much help. Another obstacle is that there are precious few photographs of the exhibition’s New York venue. There are photographs of some of the galleries at the Chicago venue, and fifty-seven works in the exhibition were reproduced as postcards, but the visual documentation is thin. So how does one find, for instance, the two sheets by Jean-Auguste-Dominique Ingres that were both catalogued as Drawing? Ingres’s oeuvre has been meticulously documented, yet none of the sources identifies which two drawings were included in the Armory Show. Several of the 1913 reviews mentioned his drawings, but none included illustrations, nor do they appear in the installation photographs or postcards. The works were lent to the exhibition by the Italian artist and architect Egisto Fabbri, whose life and collection are also well documented, but none of the sources identifies the drawings and there is nothing to indicate he ever sold them. A final Hail Mary, correspondence with Fabbri’s descendants via a generous Italian colleague, was also fruitless. And so in the end I have not been able to determine which two drawings by Ingres are the ones that were included in the Armory Show, which is disappointing. But I have also had many exciting research triumphs, which I will describe in later posts.